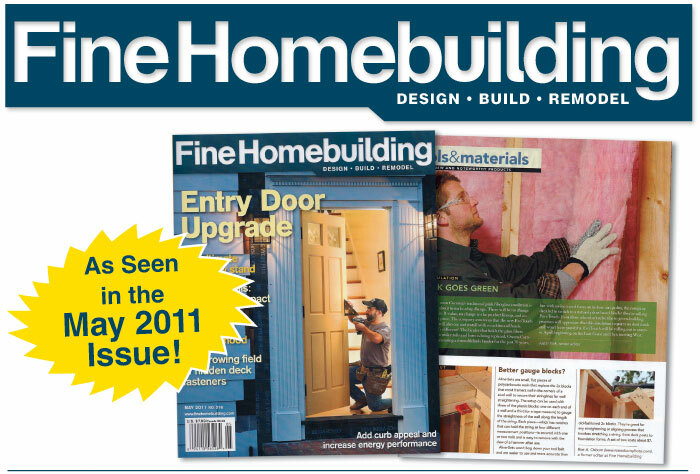 ALINE-SET was recently featured in Fine Homebuilding Magazine. Aline-Sets are small, flat pieces of polycarbonate resin that replace the 2x blocks that most framers nail in the corners of a stud wall to secure their stringlines for wall straightening. 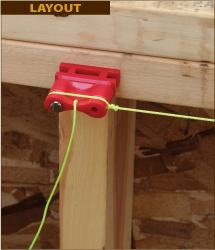 The setup can be used with three of the plastic blocks: one on each end of a wall and a third (or a tape measure) to gauge the straightness of the wall along the length of the string. Each piece - which has notches that can hold the string at four different measurement positions - is secured with one or two nails and is easy to remove with the claw of a hammer after use. Aline-Sets won't bog down your tool belt and are easier to use and more accurate than old-fashinoned 2x blocks. They're great for any straightening or aligning process that involves stretching a string, from deck posts to foundation forms. A set of two costs about $7. To download a PDF of the reprint, please click here. Listen to a podcast from the 2010 National Hardware Show.